This is the fifth post in a series on the Investigative Judgment, each of these builds consecutively on the prior so if you have not already read my most recent post please click HERE. I am going to focus in on Leviticus chapter 16 and its alleged connection to Daniel 8. SDA teach that Leviticus 16 is pointing to anti-type fulfillment in the Investigative Judgment. Before digging into this post I recommend reading through that chapter yourself first by clicking HERE. I will not paste it in entirety due to length. 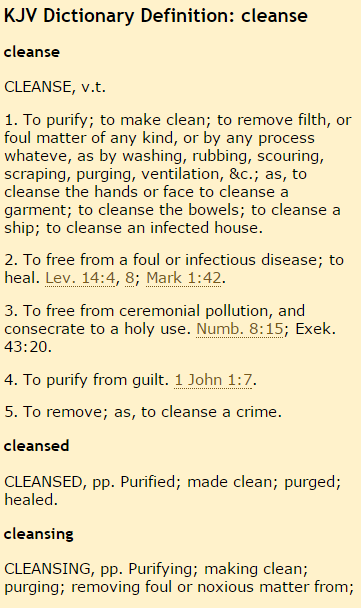 To summarize the SDA position, they argue that the referent of the word translated “cleansed” (Daniel 8:14) in the KJV is the Leviticus 16 day of atonement. The intent of the actual language is made more clear when you read the verse in a modern translation. See the same verse below in several scholarly modern versions and discern for yourself. As you can see from above we are looking at something that was desecrated and then put back in its rightful place. The word “cleansed” still conveys this idea in 1611 English, but to take that word and then eisegete an atonement referent is poor Biblical analysis. Based on the general context of the chapter 8 I would argue that the vision is saying the temple will be desecrated or even destroyed for a time and then after the fulfillment it will be restored and functioning as normal. The day of atonement is simply not in view. This is further made clear when we run a concordance check on the Hebrew word that the KJV translates as “cleased”. According to Biblehub.com we see that the word in Daniel 8:14 only appears once in the whole Bible. Based on the above no clear correlation can be made thematically or linguistically. The supposed connection simply cannot be proven in clear scripture. Without that you don’t have the investigative judgment because there there is no supposed heavenly fulfillment of the day of atonement anti-type SDA need so badly for their theological framework. That being the case though what is Leviticus 16 actually about anyways? If fulfillment of the types and shadows cannot be found in an Investigative Judgment where can we find them? After all, we are promised by Jesus Christ that all scriptures in the Old Testament speak of him. In these two verse above we have Jesus telling us that we can expect to find all things in the Old Testament fulfilled in him. Since our source for such interpretation is the New Testament it is there that we go to find when and how such things in the Old were fulfilled in Christ. What I have just described is a sound Biblical material principle for interpreting the Old Testament. I go into detail in this rule HERE if you are interested in a breakdown. Below I will use this rule to interpret Leviticus 16. The beginning of Leviticus 16 starts out describing the Holiness of God and how one cannot simply walk into the presence of God (Lev 16:1-3). Before performing his duties on the day of atonement the High Priest would have to clean his entire body, remove his decorative High Priest attire, and don simple white linen. We see this described in verse 4. Below is the Clarke Commentary on this verse which I believe provides applicable cultural context. I would argue based on my above stated material principle that this donning of the simple sacerdotal vestment is the shadow which typifies how our High Priest, Jesus Christ, humbled himself in the incarnation which was part of and in preparation for the anti-type fulfillment of the Day of Atonement. In Philippians we see Paul defines the incarnation as the humbling of Christ, then states he fulfilled his purpose by dying on the cross. The shadow of this is seen in the atonement ceremony in which the priest would make an offering in the Most Holy. The anti-type fulfillment of this we find in the New Testament where we see that Christ bore our sins to death. So in the propitiatory fulfillment Christ is both Priest and Sacrifice. Here in Hebrews we see that under the inspiration of the Holy Spirit the author establishes his context in the old covenant type and shadow and defines them as insufficient. The grammatical referent here for present age is the period of time in which the day of atonement was efficacious in type and shadow, specifically, the Old Covenant era. In the following verses the Hebrews writer provides the interpretation of the old covenant types and shadows and their fulfillment in Christ. Notice the text above speaks of an event that has already transpired. If the events above already transpired by the time Hebrews was written that would preclude an 1844 fulfillment as the year 1844 didn’t come until many years after the first century had long passed. Some SDA will attempt to argue that the tabernacle in the above verse is the heavenly sanctuary. The problem with that interpretation is that a more Biblical reading would be understanding this as speaking to the very Body of Christ (John 2:19-21). That is to say, the more perfect Temple not made by hands that Christ came through is the incarnation. Above is the antitype fulfillment of the conclusion of the High Priests work in the Temple, he bathes once more and removes his simple linens to replace with his full High Priestly garments once again. Going from his humbled state to his Priestly, typifying in fullness the humbling of the incarnation, atonement for sins, and exaltation. The scapegoat is a very important part of the Day of Atonement that also finds its antitype fulfillment in Christ. SDA disagree, they argue that the scapegoat typifies the Devil, who they say ultimately bears our sins. “It was seen, also, that while the sin offering pointed to Christ as a sacrifice, and the high priest represented Christ as a mediator, the scapegoat typified Satan, the author of sin, upon whom the sins of the truly penitent will finally be placed.” The Great Controversy, p. 422. “As the priest, in removing the sins from the sanctuary, confessed them upon the head of the scapegoat, so Christ will place all these sins upon Satan, the originator and instigator of sin.” The Great Controversy, p. 485. “Their sins are transferred to the originator of sin.” Testimonies for the Church, Vol. 5, p. 475. I find this heretical, there is nowhere in the new testament where it ever says that the Devil bears our sins. The manner in which one determines antitype fulfillment is from reading clear texts in the new testament and lining them up with the old. There are no texts whatsoever that teach the Devil bears our sins. In fact the Bible teaches the opposite! Instead what we have with the scapegoat is another type and shadow of Christ, this time taking our sins far away from us, as far is the east is from the west. Into the wilderness where they reside on us no longer. To summarize, my rejection of the SDA heavenly sanctuary doctrine stems from an utter lack of clear scripture in the affirmative. I would need a verse that plainly states “there doth exist a heavenly sanctuary in which the earthy was a replica thereof”. If you can find a verse that says that then I will submit to it, but I refuse to read between the lines with my imagination. That said, I hope you have enjoyed my study on the day of atonement. Please let me know what you think in the comments, even if you disagree with my analysis. This entry was posted in Ellen White, Heresy & Heterodoxy, Investigative Judgment, Leaving Adventism and tagged Ellen White, False Gospel, Heresy & Heterodoxy, Investigative Judgment. Bookmark the permalink. Thank you for answering a question I asked an SDA a few months ago. I stumbled into the discussion on Facebook, not clear on what SDA’s believe about this. My question was if it was the same as atonement. I couldn’t really believe he was trying to corner me on this. I thought he was either blundering around or I misunderstood him. He was puzzled and dropped the discussions. I will pray for your understanding. Christ bears our sins. He paid for our sins. He is the sacrifice. He is the goat that is killed for the sin offering. Satan is the scapegoat. The sins are laid upon him and he is bound alive that he should deceive the nations no more. I understand the scapegoat theory. The reason I reject it is that it is an assumption that makes Satan finish the atonement. You use a verse of Satan being punished. But all those outside of Christ are punished. Ellen White said Satan bears our sins. There is a difference. The way type and shadow works, theologically, is you need an unclear verse in the old testament and a clear one in the new. So you have the unclear scapegoat. Now show me a verse that says he is Satan in the new. You can’t there isn’t one. Jesus said the old testament is about him and I believe what he said. It might come down to a different methodology. The reason I don’t take single words in the old testament and string wild assumptions to them is there is no end as to the conclusions I could come up with. I would be allowed to believe whatever I want. I’ll give an example. I should never get sick or injured or die because it says we are healed. Let’s ignore that the new testament defines this as the resurrection because I don’t want to believe that. The name for the scapegoat can have many reasons. It doesn’t have to represent an entity only an action. It doesnt have to respect chronology of events either as types and shadows rarely do. Just like the high priest humbling himself in plain attire to perform the ceremony represents the humbling of Christ in the incarnation, and the doning of his priestly attire the exaltation, so the scapegoat is our sins being separated as far from us as the east is from the west. Type and shadow is supposed to be unclear. God said it would be. I am pulling these from my notes sorry for the version flipping. But the point is Jesus said the old testament is about him. So putting the two together we expect unclear images about Jesus and or his action in the old testament. That is what we find with the scapegoat. Add that to not a single verse saying the scapegoat is Satan in the new testament and with respect there is just no basis for this. Also since taking it to its logical conclusion means Satan finishes the atonement you end up with the worst Christological heresy pretty much of all time. If you’re interested in types and shadows I put this together too. But it also demonstrates that chronology of events is irrelevant in type / antitype fulfilment. All I can say is that I have studied the word very carefully and I do not believe I am lying. Thanks for reading and thanks for commenting. Surely,when on earth did people decide to interpret bible verses as they feel. Why have you Chosen to make God’s word so futile like this. Whenever i read this concocted lies my heart weeps. Why twist God’s word like this. Where is the difference between you and satan now? I have to admit I’m baffled by your comment. I care very much about what the Bible says. In the above post I have only shown you what Jesus says about the old testament, that it pointed to him. I’m sorry but it doesn’t point to Ellen Whites teachings. She came much later and is just a false prophet like joseph Smith and so many others. She is one of the false prophets he warned us of. I looked up that verse and don’t see anything about an eagles eye. Roseline, I used to have this mental lens you speak of though. When I was a child I would bring verses that confused me to the leaders in my life, Col 2-16 and Mark 7:19 would be good examples. They would diligently teach me what I was supposed to imagine while I read verses like that. In time a lens was built in my mind so whenever Paul would say we are not under the law I would read law of Moses and when he said we should uphold the law I saw Sabbath. I find this is the biggest challenge in reaching SDA today. When you post a Bible verse they don’t like it doesn’t get through. They mold it in their mind without even knowing they are doing that. It’s very sad. I would challenge you to trust that the Holy Spirit is more learned than you. He wrote his Bible in human languages and genres. He used bad grammar and slang. He intended people like you and me to read and understand. We don’t need a decoder ring. You can read it and believe it. When you find that what you are reading contradicts your beliefs you simply change what you believe not what you interpret. Understand? Sometimes I think former SDA’s are so deliberate about showing off that they are the complete opposite of SDA’s that they just disagree with everything just to disagree. “In later times the word Azazel was by many Jews and also by Christian theologians, such as Origen, regarded as that Satan himself who had fallen away from God. In this interpretation the contrast found in Lev_16:8, in case it is to be regarded as a full parallelism, would be perfectly correct,” International Standard Bible Encyclopedia, Azazel article, Eerdmen Publishing, 1915. Ultimately, we get it, you are not an SDA. You dislike the SDA’s, you think the very worst of them. But most of your arguments are lacking substance. Many even become Straw Man arguments, because this is said, then this must be true. I’m not sure why you feel the need to wage such a war. With regards to your first point I actually didn’t like that SDA were wrong about almost everything. It required a lot of study on my part in converting to Christianity when I thought I was one. So right there that excludes the possibility of Azazel being type and shadow of Satan. Instead you would read it as about Jesus. So I think it would be more accurate to say this is Jesus bearing your sin on the cross and decending to hell. Azazel prefiguring the wickedness of your sin which is being born by Christ, taking your sin as far away as the east is from the west. You simply don’t have the Biblical authority based on a clear new testament passage to make it about Satan. To prove it’s not just a grudge with SDA, let me point out with respect that your error here is the same as the Roman Catholics. They take unclear passages of the old testament to teach the perpetual virginity of Mary etc. But since Jesus says the old testament is about him and there’s no new testament passage clearly saying that Mary was perpetually a virgin, even after giving birth to Christ, then they are simply wrong. Based on the methodology they are employing. So it’s not just SDA I’m saying are wrong. It’s Roman Catholics too. Your approach to the old testament is very similar to theirs. If you applied this technique consistently you would also have to hold to the Marian dogmas, which I’m willing to bet you do not. So with respect I’d like to point out an inconsistency in your methodology as well. Jesus taught that He fulfilled the law, not satan and Him! Why do you call Me Lord, Lord, but do NOT what I say? He’s talking to you SDA’s! Hope all your religious SDA pride and arrogance is worth an eternity of torment.